I agree with the above the leg still look strange and long, I know it happens but you are basing facts on assuming the viewer will think that the leg has been broken, IMHO he will not come to that idea for sure. Keep it simple and no assuming Noel, death is already a macabre thing enough so do not overdo it ... the pose of a stiff body, not balanced is more then enough and personally I like it much more then the drop down unnatural death we all beleive in ... x'tahseb? Yep! I straightened the boot to normal position and it looks better (will post pics in near future). I like gory stuff and wanted to include the injury like a scene in Band Of Brothers!!! 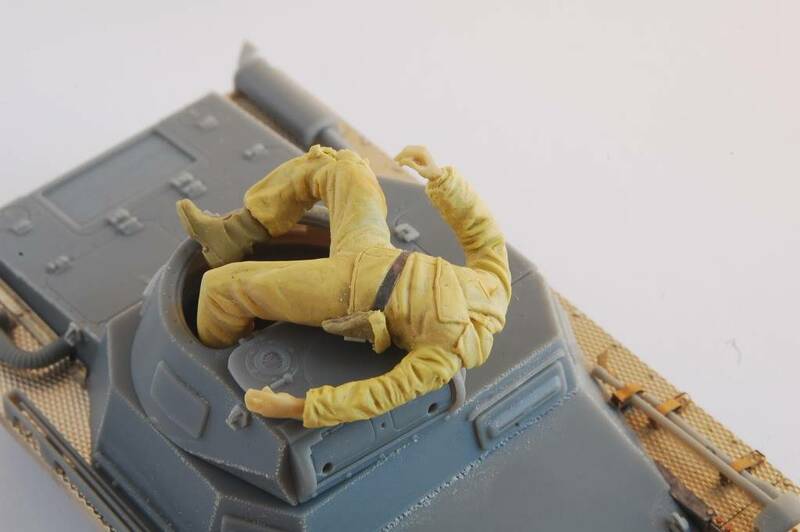 This US solider gets a direct hit in the room he is in and his friends help him out on the pavement.... his leg is a total mess... all twisted and broken and a large shrapnel hole in his boot with smoke still coming out of the hole... tal genn man! anyway....... this is my first scratch build... it's great fun and I think I'll be doing more..... more gory deaths! I think the right leg is a good length but the left leg seems long from torso to knee.... what say you lot? Noel Petroni wrote: Yep! I straightened the boot to normal position and it looks better (will post pics in near future). I like gory stuff and wanted to include the injury like a scene in Band Of Brothers!!! 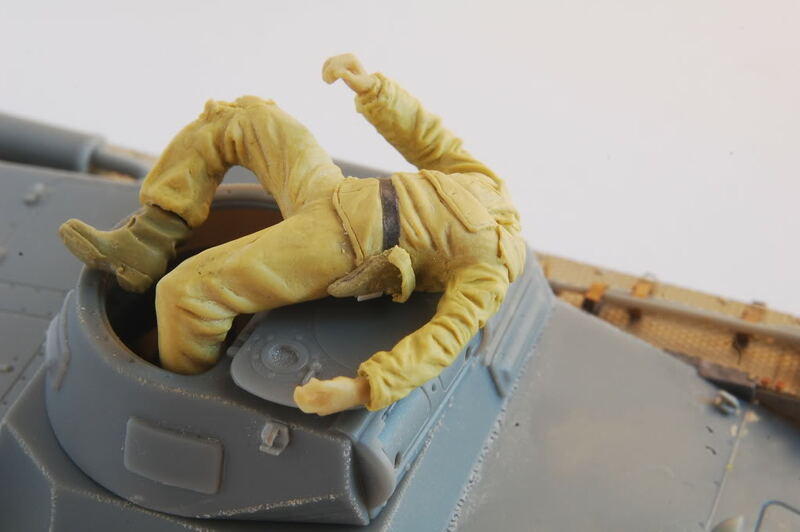 This US solider gets a direct hit in the room he is in and his friends help him out on the pavement.... his leg is a total mess... all twisted and broken and a large shrapnel hole in his boot with smoke still coming out of the hole... tal genn man! I shortened the arms slightly and they are ready for sculpting......... when my next free hour arrives!!! Well done mate, the figure is really coming up fine. Just one note on the Panzer IA - these tanks were in reality used as infantry support tanks, and had no armour what so ever. At least the early versions didn't have any armour. As such a round fired from a heavy machine gun could penetrate the steel, while an anti tank rifle would disable completely the tank. 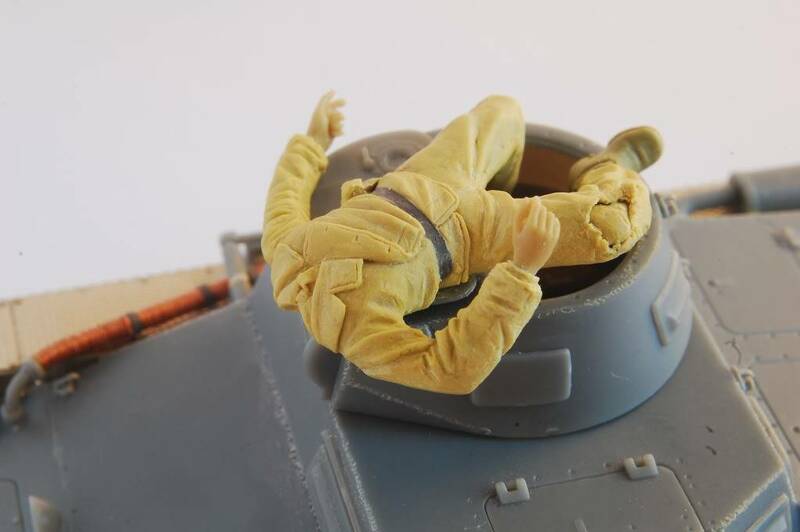 Creating a damaged tank is no joke, but I am quite sure that you will, get the best out of it. Really good and realistic now. I still don't like the hand sticking up especially since the head is slumped backwards but then i am no CSI and don;t know the effects of death and rigor mortis. Just would not do it like that myself. Other than that, i prefer the way you placed to foot now, i realised that you had a broken foot in mind but it looks much better now. Well done, some really great scratch building. Thanks guys, for your encouraging words! It's my first ever scratch built figure and I always say that the first (to anything) is an introduction and will most likely have faults.... but now I have a slight experiance of how to tackle the next one. I was not aware of what fun it is to scratch built figures!!! I always imagined it was a daunting task and quite reserved for the masters......... however, even if I do say so myself, it does not look bad for a first time and it can only get better with more practice! Last but not least........... fellow modelling friends like yourselves, with encouraging comments and noting faults to correct is what gives fuel to my enthusiasm and makes my look forward to post and progress!!! bcauchi wrote: Really good and realistic now. I still don't like the hand sticking up especially since the head is slumped backwards but then i am no CSI and don;t know the effects of death and rigor mortis. Just would not do it like that myself. Other than that, i prefer the way you placed to foot now, i realised that you had a broken foot in mind but it looks much better now. Well done, some really great scratch building. Brian, the head is not yet positioned in it's final angle. You are right to say that a slumped head does not go well with a rigid corpse.... I have noticed that myself, but thanks for pointing it out. 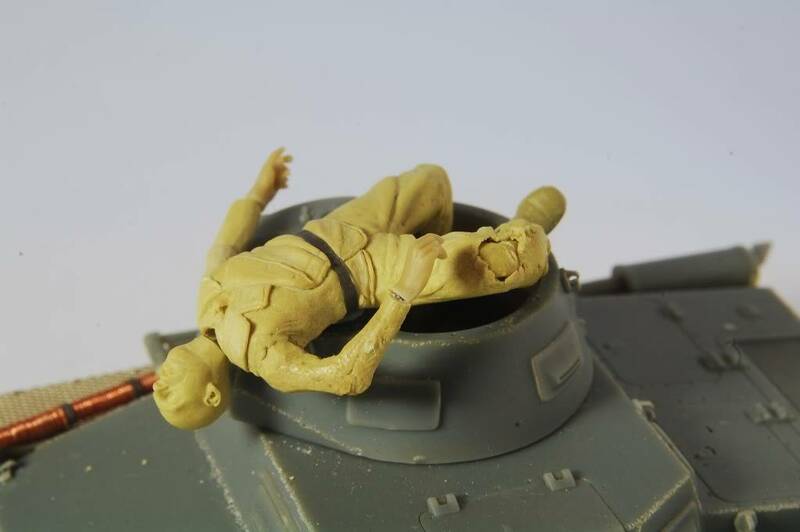 I'm not sure wether to leave only the tank and figure or to place a Polish soldier or civilian figure staring at the corpse to indicate more the effect of an overdue dead corpse.... so to speak! My opinion, is that all options will make a statement. 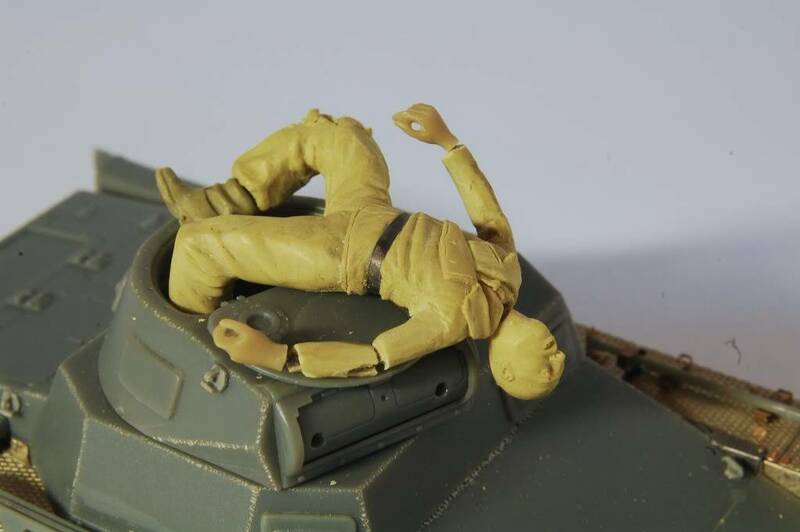 The tank by itself will make the face of death stick out. A civilian passing by oblivious to the carnage would also look good if the tank is placed in a street setting and the woman maybe holding a child's hand passes by. The child might be clutching a teddy bear or another toy and maybe he would be looking at the corpse, not his mother. A soldier would also look good, with an appraising look on his face sort of the guy got what he deserved. bcauchi wrote: My opinion, is that all options will make a statement. 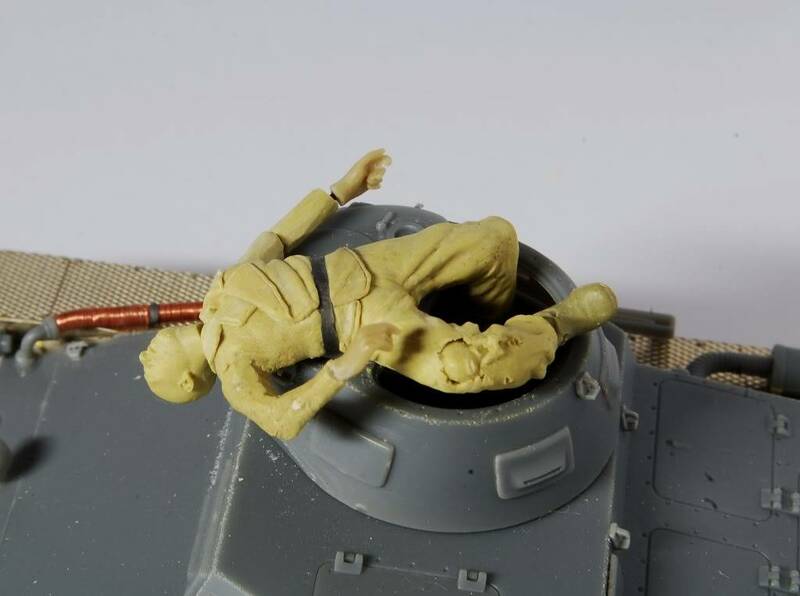 The tank by itself will make the face of death stick out. A civilian passing by oblivious to the carnage would also look good if the tank is placed in a street setting and the woman maybe holding a child's hand passes by. The child might be clutching a teddy bear or another toy and maybe he would be looking at the corpse, not his mother. A soldier would also look good, with an appraising look on his face sort of the guy got what he deserved. I like both ideas, Brian!! The second would surly make a nice piece of art and I'd be nearly tempted to do it! 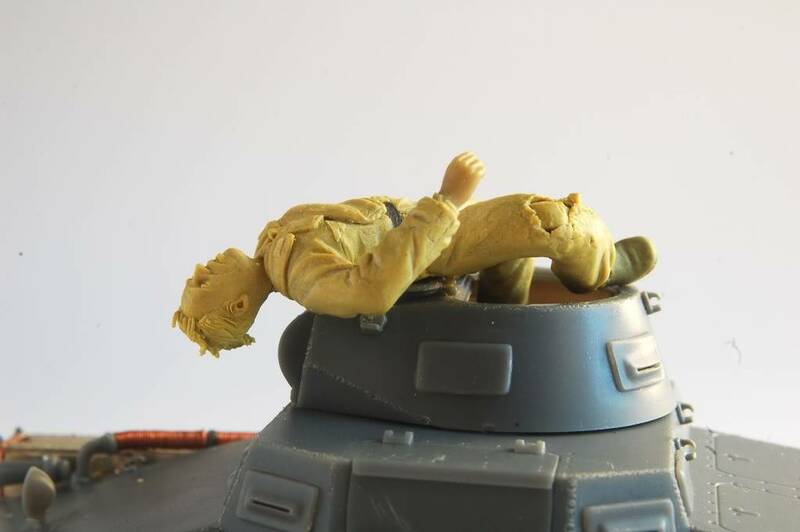 But, I enjoy weathering a tank and I am planning a new approach for this one. Thanks for your suggestions. I'm opening the holster to indicate the fact that it has been nicked by a passer by.... still more work to be done on the holster. I know mine are done with Milliput and can't be commercially produced to sell. What I can't understand is why the original artists get upset if they should come across a copy , as long as that copy is made for private use, when they know that there are materials out there for sale to produce copies at home. It is legal to make copy at home for your own personal use. Pero.... fuq kollox........ do you like my first attempt at sculpting!!! 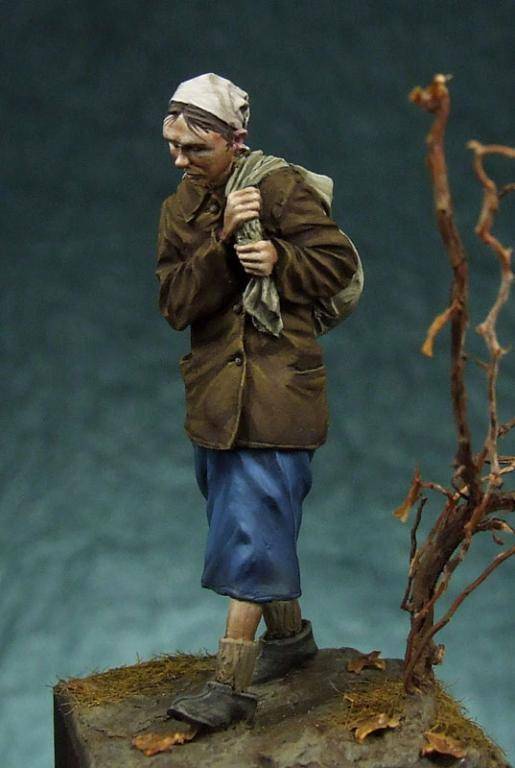 What do you think if I put this figure walking past the tank and looking at the dead crewman. The scene is in Poland. i am no expert on figures but i think that you are doing a great job and the folds on the clothing look really good. I like that figure you chose to be walking past the tank, very expressive. I beg to differ, Ivan. I know what you mean but your view relates more to city people. Look, she is miserable........ war on your doorstep is a miserable thing, so I think we can let her go on this. Mela, I'm placing the panzer on dirt roads...... a field fence on one side, some grass and dirt road. So this wench is a villager and unlike city dwellers she lacks the opportunity of a good salary. 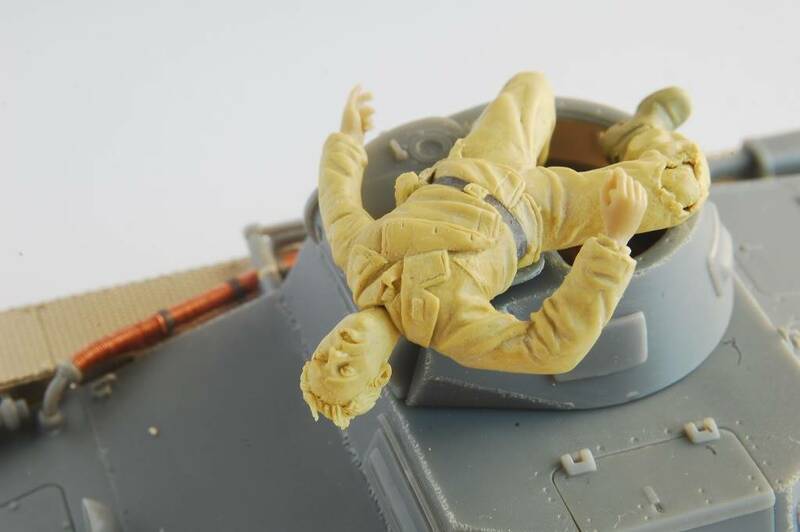 I chose this figure because it does not look too much typical Russian, in my opinion, and with her head turned to one side looking at the dead panzer crew will connect the scene more to the ground...... if you know what I mean. However, as always, thanks for your comment. As for the sculpting.... Thanks! It's great fun and I would like to discover more materials such as Magic Sculpt...... is it an important tool to have? As for the folds.... yes you are right! There is a tendency to get carried away! I stilll have to polish the Milliput, and I'm going to use fine grade furniture polish steel wool and in the process tone down some folds like you said. bcauchi wrote: i am no expert on figures but i think that you are doing a great job and the folds on the clothing look really good. I like that figure you chose to be walking past the tank, very expressive. The part that is rally bashing my brain is what damage to do to the tank. No, Ray! I don't know what materials there are out there to help with sculpting!!!! In fact I would really like some pointers on what to use!! I'm using only Milliput! ..... and what is Duro? ... SSM Band Of Brothers........... can you help please! ?